Envelope & Address Print is an envelope address printing app that helps you print addresses on envelopes quickly and productively. 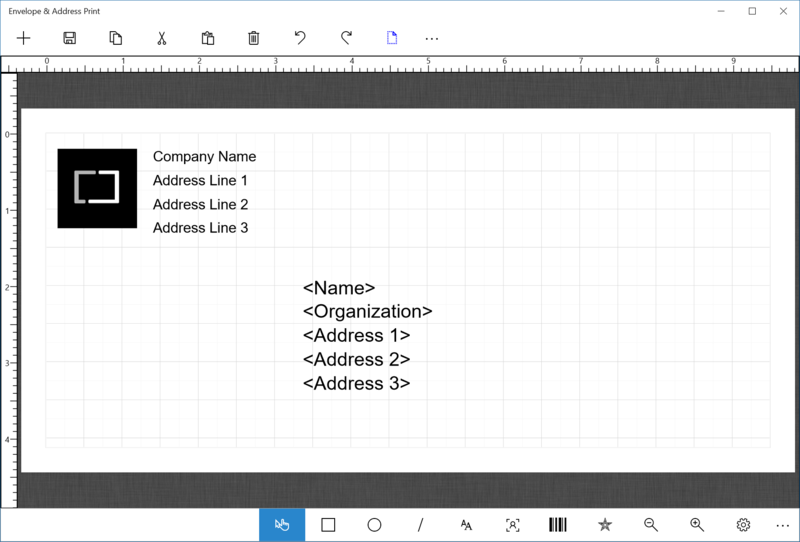 The app is equipped with a powerful software wizard that guides you through the selection of envelope sizes, generation of recipients'/sender's addresses, and extraction of data from different data sources such as Microsoft People's app, Comma-Separated-Values (CSV) file and Microsoft Excel spreadsheet. In a few minutes, you will be ready and confident of printing thousands of envelope addresses. Envelope & Address Print supports all commonly used envelope sizes such as US #10, US #6, European DL, European C5, and many more. The app also comes with a full-fledged WYSIWYG (What You See Is What You Get) designer for the final touch up of your envelope design. For example, you can place additional images, shapes, icons, emoticons and text notes. You can also easily save your envelope design and reuse it in the future. The WYSIWYG designer can also help you print running serialized counter or provide a background to brand your envelopes professionally. Have you ever thought of how many times you need to print envelope addresses? Every day, day after day, envelope after envelope. We definitely have. 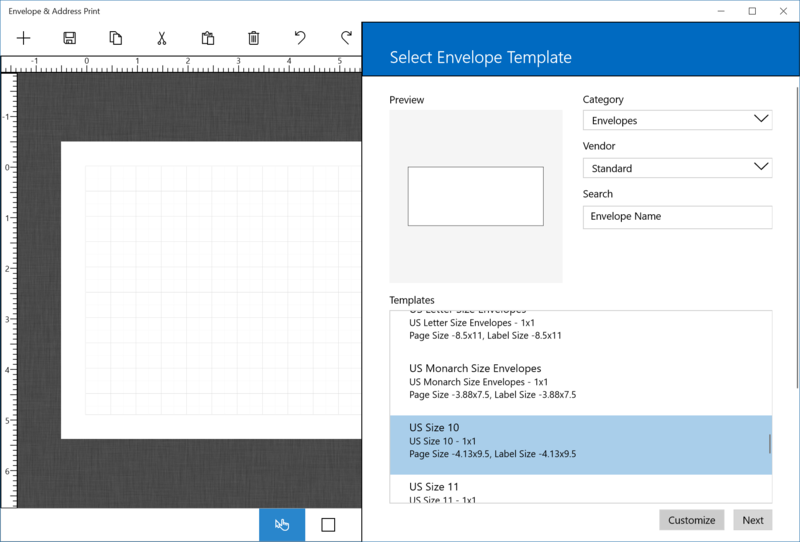 That is why we make our envelope app simple, elegant and easy to use. We have tested our app vigorously, so that you can be assured of its quality, robustness and reliability. Our app is designed in black and white color. We believe this is how a professional app should be. Whether you are a business owner, manager, manufacturer, or business executive from a Fortune 500 company, or a consultant or an entrepreneur joining the business world, we hope that you will find this envelope app useful as we have drawn deeply from our past experience, put in our best effort and invested much time to develop it. 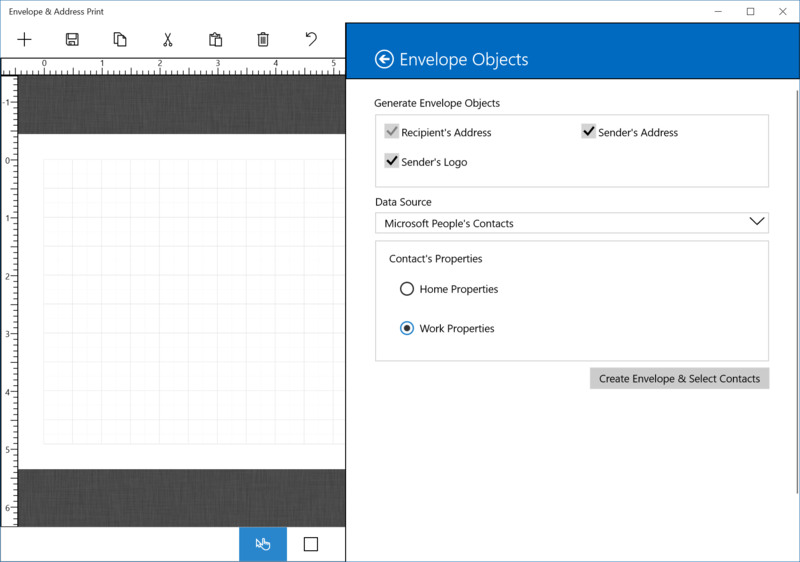 In this tutorial, we are going to use the Envelope Wizard of the app to create an envelope design that prints addresses stored in Microsoft People app. First, tap on the "+" button on the top left-hand corner of the app and select "New Envelope Wizard". Select the "US Size 10" envelope and tap on the "Next" button. 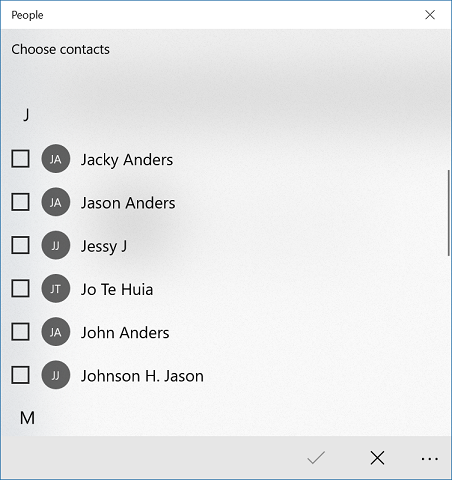 Select "Microsoft People's Contacts" as the "Data Source" and tap on the "Create Envelope & Select Contacts" button. The People app will be launched for you to select the contacts that you want to use. 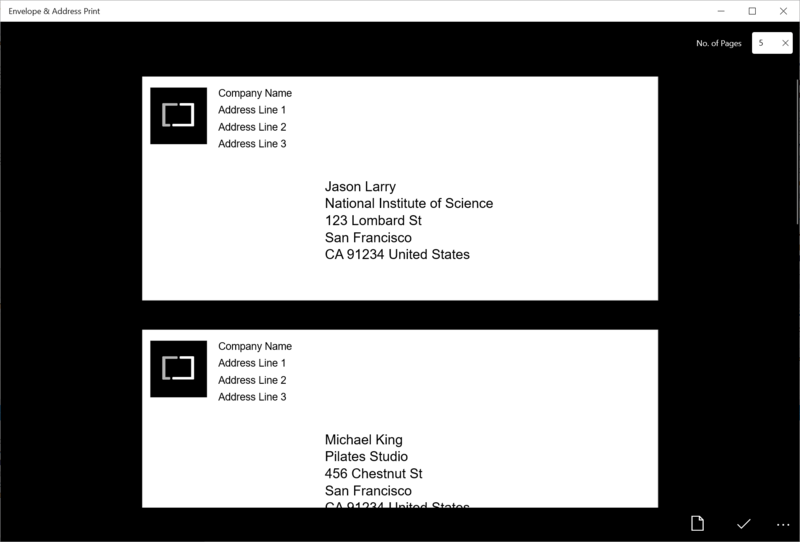 Tap on the Preview button (blue button on the top app bar) to preview the envelopes with the addresses.